The best business credit cards offer high rewards payouts, specific rewards categories, and low introductory and ongoing interest rates. Based on these criteria, we reviewed credit cards to identify the 15 best small business credit card options. We then ranked them based on costs, application process, and rewards for various types of businesses and spending. This article was originally published in May 2017. We update the content regularly because the banks, credit unions, and other providers we cover change their product offerings frequently. We also monitor interest rate changes from the Federal Reserve. The central bank held rates steady at its most recent meeting in January. The most recent changes to the best small business credit cards include changes to one card’s annual fee and available features. The Federal Reserve in January 2019 held steady its benchmark interest rate. We monitor Fed rate changes because they impact the annual percentage rates (APRs) banks charge on small business credit cards. Credit card APRs are based on a set percentage rate over the prime rate. When the prime rate changes, so do APRs. In late January 2019, Federal Reserve Chairman Jerome Powell suggested future rate increases may be put on hold unless the national bank sees evidence inflation is increasing too much. The Fed had earlier predicted it could raise rates twice in 2019, but that now appears in doubt. Increasing the benchmark rate two times would drive credit card APRs up by half a percentage point; this is something we plan to continue monitoring. 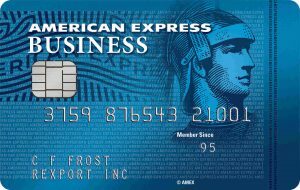 Already the card on our list with the highest annual fee, American Express in February increased the annual fee on the American Express Business Platinum Card® to $595 from $450. The hike caused us to push this card further down our list. While this American Express card still offers the best ongoing travel rewards and additional features, we believe it’s an option that’s too expensive for most small business owners. In addition to the annual fee hike, American Express added two new perks. You’ll now receive one year of global access to WeWork locations and up to $200 in statement credits each year for Dell purchases. Business credit cards can come with a variety of rewards and a range of APRs and fees. The best card for you is likely going to be determined by your personal and business situation, including the type of rewards you want. Introductory APR: Whether a card offers a 0% introductory period on purchases and balance transfers. Ongoing APR: The ongoing interest rate charged on purchases and balance transfers. Annual fee: The annual cost to have a small business credit card. Who the card is best for: Which types of businesses can benefit from a particular business credit card. Introductory rewards: Whether a card offers introductory bonus points or cash back. Ongoing rewards: The rewards structure of a small business credit card and the level of points or cash back you can earn on ongoing purchases. We also took into account minimum qualifications, but most business credit card providers require you to be a prime borrower. We recommend having a 700+ score if you want to qualify for the best cards with the best rates and largest credit lines. If you have a credit score under 670, consider the best business credit cards for fair credit. After taking these things into consideration, we recommend the Chase Ink Business Cash℠ card as the best overall card that will be a good fit for most small businesses. It is the most versatile card that provides up to 5% cash back on select purchases. The Chase Ink Business Cash℠ card is the best small business credit card because it offers the top combination of introductory and ongoing rewards and a lengthy introductory period on purchases. Owners receive 0% introductory APR on purchases for 12 months. The ongoing APR is as low as 15.49%, which is about average for a small business credit card. Chase Ink Business Cash℠ isn’t a card you should get primarily for the interest-free financing. While it’s a nice secondary benefit to have, there are better introductory offers available if you need a long 0% introductory period on purchases. Beware of the balance transfer fee, though, as it’s among the highest charges of the cards on our list. This card offers higher rewards on office supply and telecommunications services purchases than many other small business credit cards. It also pays bonus cash back on gas station and restaurant purchases, and awards one of the highest sign-up bonuses available on a small business credit card that charges no annual fee ($500). Its rich rewards make it a great credit card for startup businesses. You’ll receive $500 cash back after you spend $3,000 on purchases in the first three months after account opening. Among cards on our list that don’t charge an annual fee, this is the highest introductory offer available. 5% cash back on the first $25,000 spent in combined purchases at office supply stores and on internet, cable, cellular phone, and landline services each account anniversary year (then 1%). 2% cash back on the first $25,000 spent in combined purchases at gas stations and restaurants each account anniversary year (then 1%). This card offers the highest rewards on office supply spending, tied with American Express SimplyCash® Plus. The American Express card offers a balance cap twice as high as Ink Business Cash offers, at $50,000 in annual spending. This is a similar package of benefits as several other cards on this list offer, although the purchase protection lasts longer than the 90 days offered by the Capital One® Spark® Cash for Business. The $25,000 annual cap on the 5% and 2% spending categories may prove to be too small for some business owners. One other card on this list, American Express SimplyCash® Plus, offers a cap twice as high, at $50,000, for its 5% cash back on office supply store spending. Chase Ink Business Unlimited℠ is best for businesses that want to earn fixed-rate rewards and a solid sign-up bonus. It pays 1.5% cash back on all spending and $500 cash back after you spend $3,000 in the first three months. The ongoing APR is as low as 15.49%, which is about average. The balance transfer fee is higher than the 3% charged by the American Express Blue Business℠ Plus card, and will reduce the savings you receive when you transfer a balance from a high-interest card. The length of the introductory APR is about average among business credit cards that offer no-interest introductory periods. This card also comes with a great introductory bonus, especially because Chase Ink Business Unlimited℠ charges no annual fee. You’ll have to pay an annual fee to earn a welcome bonus higher than the $500 this card offers. Ongoing rewards are 1.5% cash back. Earn $500 cash back when you spend $3,000 in the first three months. That’s the same introductory offer as the Chase Ink Business Cash℠ offers. Among cards that charge no annual fee, this is the highest sign-up offer available. Earn unlimited 1.5% cash back on all purchases, regardless of spending category. That’s lower than the 2% cash back the Capital One® Spark® Cash for Business offers, which is the highest fixed-rate return available. Note that the purchase protection benefit lasts longer than the 90 days offered by the Capital One® Spark® Cash Select for Business. Cards that offer this benefit set coverage limits at either 90 or 120 days, so this is the best protection available. The Chase Ink Business Unlimited℠ card reward rate is lower than some other cards on this list—especially in certain spending categories. The American Express SimplyCash® Plus, for example, pays 5% cash back at U.S. office supply stores and on wireless telephone services purchased directly from U.S. service providers on up to $50,000 in purchases during a calendar year, then 1% thereafter. We considered both user reviews and our own editorial review when rating this card. Chase Ink Business Unlimited℠ reviews are very good, although not as positive as reviews for the other Chase cards on this list. Because it offers 1.5% cash back on all purchases, this isn’t seen as a top-of-wallet card for business owners serious about maximizing rewards. We rate small business credit cards based on their costs, rewards, and benefits. 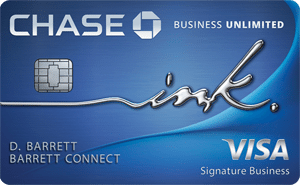 Chase Ink Business Unlimited℠ fills in the rewards gaps the Chase Ink Business Cash℠ and the Chase Ink Business Preferred℠ have, making it a perfect second or third card. When your purchases don’t fall into one of the bonus categories offered by those other cards, use Chase Ink Business Unlimited℠. You can apply for the Chase Ink Business Unlimited℠ business card directly through Chase’s website. Once you apply, you can get an approval decision in just a few minutes. You should receive your card within seven to 10 days. American Express Blue Business℠ Plus offers a 12-month, 0% introductory APR and ongoing rewards of as much as 2x points per dollar spent. The 0% period on purchases and balances transfers is one of the longest on our list, and is ideal for business owners planning to finance large purchases or transfer another card balance and pay it off over time. Ongoing APR is as low as 15.49%, which is about two percentage points lower than the average card charges. Along with one of the longest 0% interest introductory periods available, American Express Blue Business℠ Plus charges a balance transfer fee that is lower (at 3%) than other credit cards on our list, which charge 4% or 5%. That lower fee could save you hundreds of dollars in finance charges, depending on how big the balance you seek to transfer is. The ongoing APR isn’t quite as low as you’ll find on the Bank of America Platinum Visa® Business (11.49% to 22.49%). Cardholders will earn fixed-rate rewards of two points per dollar on all spending up to $50,000, which means there are no bonus categories to track, like for gas or airline purchases. This differs from some of the other best business rewards credit cards, which may offer larger rewards in certain purchasing categories, like office supplies. This card does not currently offer introductory rewards. Most small business credit cards that offer ongoing rewards also offer introductory rewards. You could earn hundreds of dollars or more by choosing another credit card. 2x points on all purchases up to $50,000 each year. 1x points on all additional purchases. Membership Rewards points can be redeemed for airfare or other paid travel through American Express Travel, gift cards, or statement credits against eligible charges. Cardholders also can transfer points to airline and hotel partners. Other American Express credit cards that award points also allow transfers, as does the Chase Ink Business Preferred℠. Extended warranty protection: American Express will match the length of the original manufacturer’s warranty if it’s less than two years. American Express provides an additional two years if the original manufacturer’s warranty is between two and five years. Coverage is limited to $10,000 per occurrence and $50,000 per account each year. The extended warranty protection is a full year longer than what Chase Ink Business Cash℠ offers. Still, the coverage limit on purchase protection is actually quite a bit lower than Chase’s $10,000 limit per occurrence. The American Express Blue Business℠ Plus card doesn’t offer any other introductory rewards. Ongoing rewards are also lower than some small business credit cards that offer 5% returns on spending in bonus categories, like the Chase Ink Business Cash℠. We considered both user reviews and our own editorial review when rating this card. Business owners laud the American Express Blue Business℠ Plus for helping to grow their firms. Both the card’s points-based rewards system and its lengthy 0% introductory offer draw praise. We scoured the internet to find user reviews for this card. Users say they value the 2x points you’ll earn in ongoing rewards and the issuer’s excellent customer service. Some users say they were disappointed this card doesn’t offer a sign-up bonus. We rate small business credit cards based on their costs, rewards, and benefits. The American Express Blue Business℠ Plus is one of the best business credit cards for owners who want or need a break on financing. It offers 0% introductory APR for 12 months. That’s one of the longest introductory period available on a small business credit card. This card isn’t as valuable as some others that offer bonus category rewards of up to 5%. 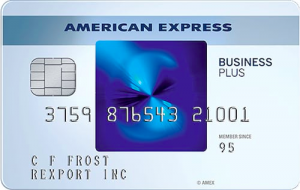 The American Express Blue Business℠ Plus credit card is available directly from the American Express website and comes with a 12-month, 0% introductory APR. You can get approved in seconds and receive your card in as few as seven days. The Bank of America® Business Advantage Travel Rewards World Mastercard® offers a fairly standard 0% introductory APR on purchases for the first nine billing cycles. What sets it apart are the 3x points per dollar spent on travel purchases and the lack of foreign transaction fees. The ongoing APR is as low as 13.49%, which is about two percentage points lower than what the typical business credit card offers. Like the other Bank of America cards on our list, the Bank of America® Business Advantage Travel Rewards World Mastercard® offers an excellent ongoing APR for applicants with excellent credit. There are plenty of cards that offer a longer 0% introductory rate, and, of course, there’s no introductory offer on balance transfers, meaning you’ll pay the ongoing APR. The Bank of America® Business Advantage Travel Rewards World Mastercard® rewards your purchases on a points system. These points never expire and you can redeem them for travel, cash back, or gift cards. Earn 25,000 bonus points when you make at least $1,000 in net purchases in the first 60 days of your account opening. These points can be redeemed for a $250 statement credit toward travel purchases. That’s low compared with other cards on our list, including the Chase Ink Business Cash℠, which offers $500 cash back after spending $3,000 within the first three months. 3 points per dollar spent on travel purchases (car, hotel, and airline) booked through Bank of America Travel Center. 1.5 points for every dollar spent on all purchases, regardless of how much you spend. When you enroll in the Business Advantage Relationship Rewards program, you can get an additional 25% to 75% rewards bonus on every purchase you make. That means you can earn up to an unlimited 2.62 points on all purchases, which is a higher rate than any other card on this list offers for everyday spending. You’ll also earn 4.12 points per every $1 you spend at the Bank of America® Travel Center. But to earn that rate, you have to have at least $100,000 in deposits or investments with the bank. Much like the other Bank of America cards on this list, the Bank of America® Business Advantage Travel Rewards World Mastercard® doesn’t come with nearly as many perks as the other best business rewards credit cards. You will receive up to $100,000 in travel accident insurance, which covers you in case of loss of life or dismemberment. Cardholders won’t receive great rewards for their office expense purchases, like the American Express SimplyCash® Plus offers. This card is mainly for borrowers who travel frequently. We considered both user reviews and our own editorial review when rating this card. Bank of America® Business Advantage Travel Rewards World Mastercard® reviews are generally very positive. This card has good value and no annual fee. But that also means it includes few of the benefits, like airport lounge access, seen on travel rewards cards that charge an annual fee. We scoured the internet to find user reviews for this card. Cardholders enjoy the rewards they can earn with the card, but note that rewards aren’t as high as those provided some other travel credit cards, like the American Express Business Platinum Card®, which pays 5x points on airfare. We rate small business credit cards based on their costs, rewards, and benefits. Editorial reviews for this Bank of America business card find this is a good pick for business owners looking for their first travel rewards card. It’s also ideal for owners leery of paying annual fees. But this card can’t compete with other travel rewards credit cards when it comes to card benefits. The Capital One® Spark® Cash for Business card is best for businesses that want to earn 2% cash back on all spending. This type of ongoing rewards is suited for businesses that have a variety of spending needs and don’t want to track category bonuses. The ongoing APR is 19.24%, which is about six percentage points higher than what the Bank of America® Business Advantage Travel Rewards World Mastercard® charges. Capital One® Spark® Cash for Business offers a very competitive annual fee of $95 (waived the first year) compared with the other best small business credit cards on our list. If you’re looking for a top small business credit card that charges no annual fee, look to the American Express Blue Business℠ Plus. This card pays 2% cash back on all spending, the highest flat-rate cash-back return among the cards on this list. Other cards offer higher returns in bonus category spending, like the 5x points the American Express Business Platinum Card® pays on airfare and hotels. The Business Platinum fares much worse in everyday spending, at 1x points. $500 cash bonus when you spend $4,500 in the first three months of account opening. The introductory reward on the Capital One® Spark® Cash for Business is worth less than what either the American Express Business Platinum Card® (75,000 points) or the Chase Ink Business Preferred℠ (80,000 points) offers. You’ll earn unlimited 2% cash back on all purchases. You’ll earn less on certain spending categories than cards with bonus categories, like the Chase Ink Business Preferred℠, which pays three points per dollar on travel and other categories. But since Capital One® Spark® Cash for Business pays a fixed rate on all spending, this card may be a more lucrative option for everyday use than other cards. Purchase protection: Covers your new purchases for up to 90 days against damage or theft up to $10,000 per claim. These benefits are fairly standard, although the length of coverage on purchase protection is less than the 120 days the American Express Blue Business℠ Plus offers. The Chase Ink Business Preferred℠ offers other perks, like cell phone insurance, that this card doesn’t offer. Other cards offer better rewards in specific expense categories, like the Chase Ink Business Preferred℠, which pays three points per dollar on travel, shipping, and advertising. Receiving 2% cash back on all purchases is great for businesses that spend in a variety of different categories or don’t want to track category spending. We considered both user reviews and our own editorial review when rating this card. The fixed-rate rewards program is highly rated, but the card might not be right for all business owners because it carries a $95 annual fee, waived the first year. We scoured the internet to find user reviews of this card. Overall, customers love the strong cash-back rewards program. Some users indicate they are disappointed that Capital One reports card activity to both personal and business credit bureaus. Some, but not all, issuers only report business card activity to the business credit bureaus. We rate small business credit cards based on their costs, rewards, and benefits. Capital One® Spark® Cash for Business is one of the best small business credit cards available. Its simple rewards program—earn 2% cash back on everything—should appeal to businesses with diverse spending needs. Its annual fee, however, might not be worth paying for owners who put $19,000 or less a year in charges on their card. You can apply online for a Capital One® Spark® Cash for Business business card and you’ll typically get an immediate decision. Once approved, you’ll get your card in seven to 10 business days. Capital One® Spark® Miles for Business is best for businesses that want to earn 2x miles on all spending. This type of ongoing rewards is suited for businesses that have a variety of spending needs and don’t want to track category bonuses. The ongoing APR is 19.24%, which is about six percentage points higher than what the Bank of America® Business Advantage Travel Rewards World Mastercard® charges. The Capital One® Spark® Miles for Business is one of just three business credit cards on our list—along with the Capital One® Spark® Cash for Business and the CitiBusiness / AAdvantage Platinum Select World Mastercard—that has an annual fee, but waives it for the first year. This could be a solid benefit if you want to test drive a card, but aren’t sure if you want to keep it. The Capital One® Spark® Miles for Business card offers the best flat-rate business travel rewards on our list, giving you 2x miles on every purchase. Introductory rewards are worth $500 in travel. You’ll earn 50,000 miles when you spend $4,500 in the first three months of account opening. Those rewards are worth $500, which is identical to what Chase Ink Business Cash℠ offers. Still, the Chase card charges no annual fee and has a lower $3,000 spending requirement to earn the bonus. With Capital One® Spark® Miles for Business, you’ll earn 2x miles on every purchase. There are no minimums you must meet in order to redeem these reward miles. The flat-rate rewards are not quite as good as the 3x points you’d earn by paying for your airfare with the Chase Ink Business Preferred℠. You can redeem your Capital One miles online by either paying for past travel, booking a new flight or rental car, or by transferring your points to one of the issuer’s airline transfer partners. Paying for past travel is a unique benefit among travel rewards business credit cards. These benefits are fairly standard, although the length of coverage on purchase protection is less than the 120 days some other cards, like the Chase Ink Business Preferred℠, offer. Capital One® Spark® Miles for Business doesn’t offer enhanced bonus category rewards. You could earn as much as 5% cash back on office supply purchases with the Chase Ink Business Cash℠ card, or twice what you’d earn with the Capital One® Spark® Miles for Business. If you don’t travel much by plane, then this isn’t a very good card for you. We considered both user reviews and our own editorial review when rating this card. Capital One® Spark® Miles for Business reviews are very good. Reviewers say the card is a solid value, particularly for small business owners who don’t have the time or interest to track category spending for bonus rewards. For everyday spending, this card offers more value than most cards, which pay just 1x points. We searched the internet for user reviews for the Capital One® Spark® Miles for Business. Many cardholders note the lack of an introductory APR and some complain the rewards are focused on travel rather than more flexible cash-back rewards. However, most customers report a positive experience with the card. We rate small business credit cards based on their costs, rewards, and benefits. Reviewers favor the simple structure of the Capital One® Spark® Miles for Business rewards program. Capital One sets no rewards caps, which may make this card more valuable over the course of a year than other cards with bonus categories. The card’s glaring weakness in the eyes of reviewers is its fairly skimpy set of additional benefits. 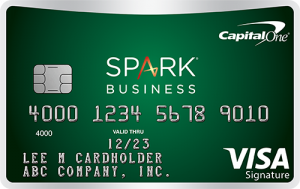 You can get the Capital One® Spark® Miles for Business card by filling out an online application with your personal and business information. You will either be approved immediately or be required to submit proof of income by mail. Once approved, you’ll receive your card in seven to 10 business days. The Bank of America® Business Advantage Cash Rewards Mastercar®d offers 3% cash back on gas station spending—and potentially more if you enroll in the Business Advantage Relationship Rewards program. That’s the top return among the best business credit cards on our list. The ongoing APR is as low as 14.49%, which is the lowest among credit cards on this list. The ongoing APR is low, but it’s not the lowest on our list. If the cost to finance is the most pressing need you have in a business credit card, consider a card like the Bank of America® Platinum Visa®, which offers a potentially lower ongoing APR (11.49% to 22.49%) for cardholders with excellent credit (750+). You’ll need to make just $3000 in purchases during the first 90 days after you open your account to qualify for the introductory rewards. Earn 3% cash back on gas station and office supply store spending. This card is among the best cash-back business cards. You’ll earn a $300 statement credit when you make at least $3000 in net purchases within 90 days of your account opening. That’s lower than the $500 cash-back reward the Chase Ink Business Cash℠ card offers after you spend $3,000 within the first three months. 3% cash back on your choice of one of the following six categories: gas stations (default), office supply stores, travel, TV/telecom & wireless, computer services or business consulting services (for the first $50,000 in combined choice category/dining purchases each calendar year, 1% thereafter). This card offers unique bonus value for businesses that have a Bank of America checking or savings account. Enroll in the Business Advantage Relationship Rewards program to receive an additional 25% to 75% rewards bonus on every purchase. These tiered-relationship bonuses begin when you have at least $20,000 in assets with the bank. Only the Bank of America® Business Advantage Travel Rewards World Mastercard® offers a similar bonus. This card doesn’t come with the same level of benefits you’ll find on other cards on our list. You will receive up to $100,000 in travel accident insurance, which covers you in case of loss of life or dismemberment. This is also available on the Bank of America® Platinum Visa® Business card. The reward system is not as good as other cards if you plan on using it for business expense purchases you’re paying off every month—unless you have an existing Bank of America banking relationship. We considered both user reviews and our own editorial review when rating this card. Bank of America® Business Advantage Cash Rewards Mastercard® reviews are generally mixed. This card is cheap to own, but the low APR and lack of an annual fee do come with a cost. Rewards and benefits aren’t as good on this Bank of America business card as on other cards. We rate small business credit cards based on their costs, rewards, and benefits. Editorial reviews find the Bank of America® Business Advantage Cash Rewards Mastercard® to be adequate, but definitely not flashy. It offers good, but not great, ongoing rewards and good, but not great, introductory rewards. The best feature of this Bank of America business card is its ongoing APR, which is among the lowest available among small business credit cards. You can apply online for a Bank of America® Business Advantage Cash Rewards Mastercard®. Once you fill out the application form containing basic personal and business information, you could get approved within minutes. Once approved, you’ll receive a card in the mail within seven to 10 days. The Chase Ink Business Preferred℠ credit card is best for businesses that travel moderately. It offers 3x points for travel purchases with a modest $95 annual fee, lower than the $450 the American Express Business Platinum Card® charges. The ongoing APR is as low as 18.24%, which is two percentage points or more higher than the typical small business credit card. The ongoing APR is among the highest on our list, so it’s best to avoid the Chase Ink Business Preferred℠ if you have to carry a balance. This is also the first of our cards that charges an annual fee, although another of the best business rewards credit cards levies a much higher annual fee of $450, so this Chase card’s $95 shouldn’t necessarily scare you away. The Chase Ink Business Preferred℠ card offers top-notch rewards on travel spending (3x per dollar) while charging an annual fee under $100. There’s one other card on our list that offers better ancillary travel benefits—the American Express Business Platinum Card®. But for most businesses with travel budgets, Chase Ink Business Preferred℠ is the better pick because it has a much lower annual fee ($95 versus $450) and higher introductory rewards. You’ll earn 80,000 Ultimate Rewards points when you spend $5,000 within the first three months of account opening. Rewards points can be redeemed for airfare or other paid travel through Chase, gift cards, or statement credits against eligible charges. Cardholders also can transfer points to airline and hotel partners. When redeemed for travel, the points are worth $1,000, well above other cards on our list. 3 points per dollar on the first $150,000 spent in combined purchases each account anniversary year spent in these categories: travel, shipping, advertising on search engines and social media sites, and on internet, cable, and phone services. If your business spends heavily in the three-point categories, this card may well be worth it to you. Only the American Express Business Platinum Card® offers higher rewards (5x) on travel, shipping, and advertising spending, but you’ll pay a higher annual fee of $450. As you should expect with a card that charges an annual fee, Chase Ink Business Preferred℠ includes some premium benefits, like auto rental insurance. But it also comes with perks other cards on our list don’t offer, including cell phone protection and trip cancellation insurance. Cell phone protection: You and your employees named on the phone bill you pay for with your card are covered for up to $600 in theft or damages per claim. You are limited to three claims per 12-month period, with a $100 deductible per claim. Trip cancellation/delay insurance: If your trip is canceled, you can be compensated up to $5,000 for pre-paid expenses such as airfare or hotels. If your trip is delayed for 12 hours or more, you can be reimbursed up to $500 for your hotel room, meals, and transportation. 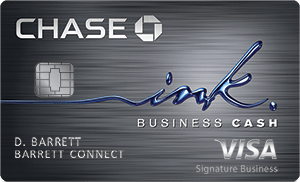 The Chase Ink Business Preferred℠ card is not a good choice for businesses looking for an interest-free period on purchases or balance transfers. The card also lacks bonus rewards for spending on office supplies, restaurants, and gas, like you’d find on the American Express SimplyCash® Plus. We considered both user reviews and our own editorial review when rating this card. Reviews are extremely positive. Some reviews champion this travel rewards credit card over the American Express Business Platinum Card® because it offers huge value at a significantly lower cost. We searched the internet for user reviews of this Chase small business credit card. While the card charges an annual fee, cardholders love the high introductory rewards and the ongoing points that they earn on so many different purchases. Some users say they’re disappointed the card doesn’t offer more travel benefits. We rate small business credit cards based on their costs, rewards, and benefits. Chase Ink Business Preferred℠ reviews find this card to be equal to or narrowly behind the American Express Business Platinum Card® as the best small business travel credit card. It’s a better travel credit card for businesses that don’t want or need luxury travel benefits. Some reviewers are disappointed the card doesn’t offer more bonus categories. The United Explorer Business Card is best for business owners who are loyal United Airlines customers. You’ll earn 2x miles on all United purchases, including tickets, inflight food, and Wi-Fi charges. This card also earns bonus rewards on restaurant, gas stations, and office supply spending. The ongoing rewards are similar to what other airline cards offer. The ongoing APR is as low as 18.24%, which is two percentage points or more higher than the typical card charges. The $95 annual fee is nearly identical to the annual fee assessed on the Capital One® Spark® Miles for Business ($95, waived the first year) and the United Explorer Business Card ($95, waived the first year). Ongoing APR may be up to four percentage points higher than what the Bank of America® Business Advantage Travel Rewards World Mastercard® charges. The United Explorer Business Card offers introductory rewards worth at least $750 on travel purchases. You’ll also earn ongoing rewards on United Airlines, restaurant, gas station, and office supply purchases. 75,000 miles when you spend $5,000 in the first three months after account opening. While you’ll also earn 75,000 points with the American Express Business Platinum Card®, you’ll have to spend $20,000 to earn that reward. The Chase Ink Business Preferred℠ pays 80,000 points after you spend $5,000 within the first three months, which is a bit better than this card. 2 miles per $1 spent on purchases from United, including tickets, Economy Plus, inflight food, beverages, Wi-Fi, and other United charges. 2 miles per $1 spent at restaurants, gas stations, and office supply stores. Other business travel credit cards offer higher returns on flight purchases, including the American Express Business Platinum Card® (5x miles) and the Chase Ink Business Preferred℠ (3x miles). Few business credit cards for travel offer rewards on restaurants, gas stations, and office supplies. The United Explorer Business Card offers several travel and purchase protections common to small business credit cards, like extended warranty protection. It also offers coverage a smaller number of cards offer, like baggage delay insurance and priority boarding. Free checked bag: You and one companion traveling on the same reservation will each receive your first standard checked bag free. Priority boarding: You and companions on the same reservation will be able to board prior to general boarding. 2 United Club one-time passes: Enjoy complimentary beverages, snacks, and amenities like work spaces, free Wi-Fi, and more each anniversary year. The free checked bag benefit is similar to what other airline-affiliated cards offer, like the American Express Platinum Delta SkyMiles Business Credit Card. The Southwest Rapid Rewards Premier Business Credit Card offers a companion certificate, unlike this card. The United Explorer Business Card doesn’t offer free access to airport lounges, like the American Express Business Platinum Card® does, nor does it offer a statement credit toward air travel expenses. The rewards on air travel are also lower than cards like the Chase Ink Business Preferred℠ offer (3 points per $1 spent). We considered both user reviews and our own editorial review when rating this card. United Explorer Business Card reviews are primarily positive. Airline-specific perks like priority access are big pros for this card. But the ongoing rewards are low compared with other travel rewards credit cards. We searched the internet for user reviews on the United Explorer Business Card. Users say they enjoy the travel rewards they are able to earn by spending on United Airlines flights. Some users say they would like to be able earn a companion pass, like Southwest Airlines and Alaska Airlines offer through their co-branded credit cards. We rate small business credit cards based on their costs, rewards, and benefits. United Explorer Business Card reviews say frequent United Airline flyers should strongly consider this card. It offers United-specific benefits that no other card can match, like a free checked bag. The ongoing rewards on both United spending and other bonus categories like restaurants are low compared with some cards that offer 3x points per dollar spent. American Express SimplyCash® Plus is best for businesses wanting to earn rich rewards without paying an annual fee. It offers a generous 5% cash back on office supply spending up to $50,000 per year. You’ll also enjoy the longest 0% introductory period of any of the best small business credit cards. The ongoing APR is as low as 14.49%, which is a percentage point or more below average. On the low end of the range, this card’s ongoing APR is quite good for owners with a personal credit score of at least 750. The APR isn’t quite as good as the Bank of America® Platinum Visa® Business card, but if you carry no or very little balance, there will be no tangible difference. The American Express SimplyCash® Plus ongoing rewards are generous, particularly when it comes to office supply spending. You’ll earn the same 5% cash back at U.S. office supply stores with this card as you would with Chase Ink Business Cash℠, but the $50,000 spending cap is twice as much as the Chase card allows. American Express doesn’t currently offer introductory rewards on this card. 5% cash back at U.S. office supply stores and on wireless telephone services purchased directly from U.S. service providers on up to $50,000 in purchases during a calendar year, then 1% thereafter. 1% cash back on all other eligible spending. This is the only card on our list of the best small business credit cards that offers bonus rewards on internet advertising, which could come in handy for firms that use Facebook or Google ads to support their business. The spending requirement is among the highest we’ve seen for rewards less than $1,000. 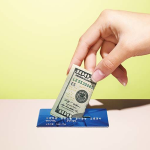 And you’ll want to avoid this card when traveling overseas, not only because you’ll pay foreign transaction fees, but because American Express isn’t as widely accepted as Visa or Mastercard. We considered both user reviews and our own editorial review when rating this card. For businesses with more than $25,000 in office supply expenses annually, the American Express SimplyCash® Plus is the go-to card because it has a higher ($50,000) spending cap than the Chase Ink Business Cash℠ card. It doesn’t offer a sign-up bonus, which is a real turn-off for some. You can fill out an online form to apply for the American Express SimplyCash® Plus card on American Express’ website, and you could receive a decision in as little as 30 seconds. Once approved, your card will arrive in the mail within seven to 10 days. The Southwest Rapid Rewards Premier Business card is best for businesses that frequently use Southwest Airlines because they offer increased rewards for expenses with Southwest airlines and its hotel and car rental partners. If Southwest isn’t your primary carrier or you want more flexible travel rewards options, a card like Chase Ink Business Preferred℠ is a better choice. The ongoing APR is as low as 18.24%, which is higher than the average card charges. The ongoing APR on this card is fairly high compared with other cards on this list, so if you plan to carry a balance, you should choose a card that offers a lower interest rate, like the Bank of America® Business Advantage Cash Rewards Mastercard®. 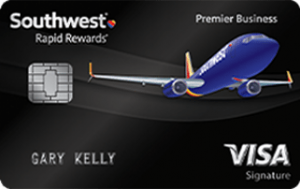 The best rewards for the Southwest Rapid Rewards Premier Business card come from purchases with Southwest airlines and their hotel and rental car partners. This card should not be used on non-Southwest expenses (one point for every dollar spent), as other cards on this list offer higher returns. You’ll earn 60,000 points when you spend $3,000 in the first three months. That could be worth up to $600 in travel, which is a higher reward than the $500 cash back you’d earn with the Chase Ink Business Cash℠ card. Earn two points for every $1 spent on Southwest airline purchases. Earn two points for every $1 spent with Rapid Reward Hotel and Car Rental partners. Earn 6,000 bonus points on every cardmember anniversary. The travel rewards on this card aren’t as good as what you’d earn with the Chase Ink Business Preferred℠, which pays 3x points on travel. You’ll earn the same rewards on flights as with the United Explorer Business Card (although that card pays rewards on United flights only), but less on other bonus categories, like dining. Southwest offers one of the potentially most lucrative perks you’ll find on a travel rewards credit card: a companion pass. Unlike the companion fare offered by the Bank of America® Alaska Airlines Visa® Business Card, this pass is good all year—but it’s not cheap. You’ll need to earn 110,000 qualifying points or take 100 qualifying one-way flights in a calendar year to earn a companion pass, which gets your guest on a flight you’ve bought a ticket for free (minus taxes and fees). Collecting the sign-up bonus only gets you halfway to the number of points you’ll need. If you don’t regularly use Southwest or their partners, this isn’t a good card for you. Other business travel rewards cards that offer rewards on all flight purchases may be a more flexible option. This is an ideal card if you frequently travel with Southwest or use one of the Rapid Rewards hotel or car rental partners. We considered both user reviews and our own editorial review when rating this card. Southwest Rapid Rewards Premier Business card reviews are mostly positive. The card offers excellent rewards for travelers who frequently fly Southwest Airlines. But it lacks any additional bonus rewards categories available on some travel credit cards. We searched the internet for Southwest Rapid Rewards Premier Business card user reviews. Customers mostly appreciate the travel rewards that the card offers, although they do note that rewards are not as flexible as some other cards. While some customers report issues enrolling with the correct introductory reward, these complaints are mostly limited to individual incidents. We rate small business credit cards based on their costs, rewards, and benefits. Reviewers praise this Southwest business card for the ability to earn a companion pass. It also offers 6,000 anniversary points, which reviewers praise as a nice perk. But the card pays no bonus rewards on other category purchases, like the United Explorer Business Card, which pays two miles per dollar spent on restaurants. You can apply for the Southwest Rapid Rewards Premier Business credit card online through Southwest’s secure website. Approval can take seven to 10 days but once you’re approved, you’ll get your card in about a week. The Bank of America® Alaska Airlines Visa® Business Card is best for businesses that fly this airline frequently and can take advantage of the introductory companion fare plus 40,000 bonus miles after you spend $1,000 in the first 90 days. This card comes with no introductory APR; its ongoing APR is as low as 17.24%, which is slightly higher than average. This card offers no 0% introductory APR, so it’s not a good fit for a company that needs to finance a large purchase or transfer an existing balance from a high-interest credit card. The ongoing APR is on the high side as well, when compared with other cards on our list. 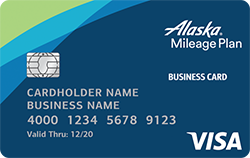 The Bank of America® Alaska Airlines Visa® Business Card is a great value simply because of its companion fare, which allows you to buy one ticket and get another (starting at $121). This benefit could easily more than pay for the cost of this card’s annual fee, and is available on very few travel rewards cards. You’ll earn a companion fare and 40,000 bonus miles after you make at least $1,000 in purchases on your card within the first 90 days. Just two other cards on our list offer a companion fare—Southwest Rapid Rewards Premier Business and the CitiBusiness / AAdvantage Platinum Select World Mastercard. This can be an extremely lucrative perk. Three miles for every dollar spent with Alaska Airlines. One mile for every dollar spent in other purchases. Companion fare for each card anniversary. Each year on your account anniversary, get a companion fare starting at $121. The companion fare reward is the easiest and cheapest to obtain among the cards on our list that offer companion fares, including the Southwest Rapid Rewards Premier Business and the CitiBusiness / AAdvantage Platinum Select World Mastercard. Along with the companion fare benefit, this card also offers another perk that most cards don’t have, and is more generous than the ones that do: a free checked bag. The cardholder and up to six passengers traveling on the same reservation may check one bag free of charge when flying. If Alaska Airlines isn’t the airline you use most often for business travel—or you need a travel rewards card that offers points or miles for all flights—stick with something like the Chase Ink Business Preferred℠. While this business credit card offers great introductory and ongoing travel rewards plus travel-related perks, the rewards are specifically for Alaska Airlines. We considered both user reviews and our own editorial review when rating this card. Bank of America® Alaska Airlines Visa® Business Card reviews are very positive. It especially earns high marks for its companion fare reward, which could save travelers hundreds of dollars a year on a companion ticket. We searched the internet for Bank of America® Alaska Airlines Visa® Business Card user reviews. Although it carries an annual fee for each business and individual card, cardholders note that the card offers ongoing rewards superior to most travel cards. Many customers aren’t aware that Alaska Airlines serves more than 900 destinations, but many who find they can use the rewards love this card. We found no negative feedback in online reviews. We rate small business credit cards based on their costs, rewards, and benefits. Although this Bank of America business card isn’t going to be useful for all small business owners, editorial reviews found that the card offers big benefits to frequent Alaska Airlines patrons. Its ongoing rewards are seen as average, but the annual companion fare helps give this card real value. You can apply for the Bank of America® Alaska Airlines Visa® Business Card directly through the Bank of America website. Approval can be as quick as just a few minutes and you can receive your card within seven to 10 business days. Visit Bank of America to see if you qualify. The Bank of America® Platinum Visa® Business offers the lowest ongoing APR range among the cards on our list (11.49% to 22.49%) and charges no annual fee, making it right for anyone who’s looking for a low-cost option. This card also offers one of the easiest ways to trigger an introductory bonus, only requiring you to spend $3000 in the first 90 days to get a $300 credit statement. This card offers no introductory 0% financing on balance transfers, and charges a high balance transfer fee—although not quite as high as the Cash Ink Business Cash card. Choose this card only if you need access to cheap ongoing financing. There are several better options on our list for introductory purchases and balance transfers. The Bank of America® Platinum Visa® Business card offers an introductory award that is as easy to trigger as any other card on the list, but the card lacks a strong ongoing rewards program. The $300 introductory bonus is quite low when compared with other cards on this list. If you apply online, you can receive a $300 statement credit bonus after you make at least $3000 in net purchases in the first 90 days your account is open. The Bank of America® Platinum Visa® Business card doesn’t offer a rewards program as an opportunity to earn either points or cash back. It is the only card on our list that doesn’t offer ongoing rewards. This card doesn’t offer many additional bells and whistles, especially when compared with some of the other best small business credit cards on our list. The only additional feature worth noting is travel accident insurance, which is also available on the Bank of America® Business Advantage Travel Rewards World Mastercard®. Travel accident insurance: You will receive up to $100,000 in travel accident insurance, which covers you in case of loss of life or dismemberment. Bank of America® Platinum Visa® is the only card on our list that doesn’t offer ongoing rewards. But this is an affordable card if you plan to carry a balance because it offers the lowest APR range among the best small business credit cards. If you want a lower APR and want to earn ongoing rewards, consider the Bank of America® Business Advantage Cash Rewards Mastercard®. We considered both user reviews and our own editorial review when rating this card. Bank of America® Platinum Visa® Business card reviews are generally mixed. While both user and editorial reviews recognize the card’s chief benefit—a low APR—there’s no real enthusiasm for this card. Its rewards are mediocre, as are its benefits. We searched the internet for Bank of America® Platinum Visa® Business card user reviews. Customers love the lack of an annual fee, low APR, and relatively low qualification requirements. However, many wish that the card gave them the chance to earn higher introductory or ongoing rewards. We rate small business credit cards based on their costs, rewards, and benefits. Editorial reviews for this Bank of America business card give the card credit for what it is: an excellent low APR credit card. It’s seen as a perfect pick for business owners concerned primarily about the cost of financing business debt. But reviewers don’t find much else to applaud in this card. You can apply online for a Bank of America® Platinum Visa® Business card. Once you fill out the application form with your basic personal and business information, you’ll typically get an instant approval or rejection. Once approved, you’ll receive a card in the mail within seven to 10 days. The CitiBusiness / AAdvantage Platinum Select World Mastercard offers 70,000 introductory bonus miles for qualifying new cardholders as well as one to two miles for every dollar spent. This card is best for business owners who frequently fly American Airlines. Other cards offer better rewards for general spending. The ongoing APR is as low as 17.99%, which is slightly higher than the typical small business credit card charges. If you’re looking for a 0% introductory offer, you’d be better off choosing another card like the American Express Blue Business℠ Plus (12 months free financing on purchases and balance transfers). The best rewards come from using the CitiBusiness / AAdvantage Platinum Select World Mastercard on American Airlines travel, and those rewards give you the ability to do more traveling with American Airlines. You can receive three points or more on airline spending with other cards, although this card is still a good deal if you’re an American Airlines’ loyalist. You can earn 70,000 American Airlines AAdvantage bonus miles when you purchase $4,000 in the first four months of your account being open. That bonus could be worth $700 in travel. That bonus is slightly lower than the 80,000 points the Chase Ink Business Preferred℠ offers. Earn two miles for every $1 spent at gas stations and certain telecommunications merchants, car rental merchants, and cable and satellite providers. Earn two miles for every $1 spent on American Airline purchases. You’ll earn more travel rewards (3x) with the Chase Ink Business Preferred℠ card, and you’re not restricted to earning points on American Airlines flights. Like the Southwest Rapid Rewards Premier Business card, the CitiBusiness / AAdvantage Platinum Select World Mastercard offers a companion pass after you spend $30,000 in a year. The companion ticket costs $99 plus fees of $21.60 to $43.60 when the primary cardholder buys a ticket. That’s not quite as good as the free (minus fees) ticket Southwest offers. If you don’t fly American Airlines constantly, then this isn’t the right card for you. This is a great card if you can benefit from the American Airlines-centric rewards system, but it’s missing any other type of reward. We considered both user reviews and our own editorial review when rating this card. CitiBusiness / AAdvantage Platinum Select World Mastercard reviews are generally positive. For travel rewards enthusiasts, the card’s 2x miles per $1 spent on American Airlines’ flights is seen as a slight negative. We searched the internet for user reviews on the CitiBusiness / AAdvantage Platinum Select World Mastercard. Users love the large introductory reward and the first year free annual fee. Plus, they find the bonus rewards on non-travel spending useful. But they complain the flight rewards are too small compared to other cards that offer 3x to 5x points per dollar. We rate small business credit cards based on their costs, rewards, and benefits. This CitiBusiness credit card is seen as a must-have for frequent American Airlines flyers because of its unique benefits for users of that airline. It offers free checked bags and priority boarding, something most other credit cards don’t offer. This CitiBusiness card is missing other top travel perks, however, like access to airport lounges and annual credits toward air travel. 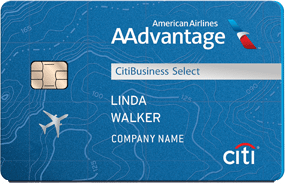 You can apply online at Citi’s website or via phone to get the CitiBusiness / AAdvantage Platinum Select World Mastercard. Once approved, you’ll receive your card in about one week. The American Express Business Platinum Card® is best for businesses that can spend $20,000 within three months to earn the introductory 75,000 bonus points. At $595, this card’s annual fee is significantly more expensive than the Capital One® Spark® Miles for Business card ($95, waived the first year). This charge card carries no APR because you must pay your balance in full each month. The American Express Business Platinum Card® is a charge card, so you must pay it off every month. While there is no APR cost, you’ll only offset the annual fee cost if you use the card quite a bit to travel, and you’ll still have to pay a late penalty if you miss a payment ($38 or 2.99% of any past due, whichever is greater). The $595 annual fee you’ll pay is the highest among the cards on this list. But perks like free airport lounge access and reimbursement for Global Entry or TSA PreCheck airport screening programs means this card carries well more potential value than any other card on our list. The American Express Business Platinum Card® offers strong rewards for airplane travelers and business owners who frequently stay in hotels. You’ll earn five points per dollar spent on airfare and hotels booked through American Express Travel. That’s three points more than Capital One® Spark® Miles for Business offers. The introductory rewards are worth $750 or more when redeemed for travel. Earn 50,000 points after you spend your first $10,000. Receive an extra 25,000 points after you spend an additional $10,000. Those points are worth $750+ when redeemed for travel. The Business Platinum offer falls short of the $1,000 worth of bonuses you could receive with the Chase Ink Business Preferred℠. 5x points on eligible flights and hotels. 1.5x points per dollar on purchases of $5,000 or more, up to 1 million additional points per year. 1x points on all other spending. No other card on our list offers a better return on airfare or hotel purchases, and the Business Platinum is the only card to offer bonus points on purchases of $5,000 or more. That makes this card ideal for businesses looking for high limit credit cards to make large purchases. The ongoing rewards alone probably aren’t enough to justify the $595 annual fee. This card comes with an exceptional suite of benefits, including airport lounge access and other travel perks. Those benefits can be worth well more than the annual fee if you own a business that can take advantage of them. American Express lounges: Free access to American Express’ network of Centurion lounges located in slightly less than one dozen U.S. airports. Other airport lounges: Priority Pass Select membership, which gets you free access to more than 1,000 lounges worldwide for you and two guests. Airport screening: Either a $100 statement credit for Global Access or $85 statement credit for TSA PreCheck once every four years. Travel credit: A $200 annual statement credit toward air travel expenses like baggage fees and inflight food and drink. Rental status: Elite status at a number of car rental agencies. Free Wi-Fi: 10 annual free Gogo inflight Wi-Fi passes. Rebate for redeemed points: 35% points rebate if you book a business or first-class flight, up to 500,000 bonus points per calendar year. WeWork access: A complementary year of access to more than 300 WeWork locations worldwide (enroll between February 15, 2019 and December 31, 2019). Dell statement credit: Up to $200 in statement credits annually for Dell purchases. No other card on our list offers airport lounge access, TSA PreCheck reimbursement, or travel credits, which are designed to compete with the free baggage check benefits that cards like the CitiBusiness / AAdvantage Platinum Select World Mastercard offer. There are no rewards for businesses that don’t spend a lot of time or money traveling. Other cards offer a better return on everyday spending, including the American Express Blue Business℠ Plus. Also, while it provides the best rewards to businesses that spend a lot of money each month on their credit card, you’re required to pay it off each month. We considered both user reviews and our own editorial review when rating this card. 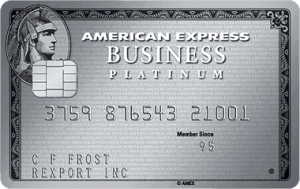 American Express Business Platinum Card® reviews are generally very positive. The travel-related benefits like annual statement credits for travel expenses get high marks. However, it’s not seen as a particularly good card for earning rewards outside of travel spending. We rate small business credit cards based on their costs, rewards, and benefits. The American Express Business Platinum Card® is a well-reviewed credit card that’s widely recognized as much for its travel rewards as its suite of travel-related benefits. No other business rewards credit card can beat the Amex card when it comes to perks. But its annual fee can be a burden on some businesses, and it lacks rewards in other spending categories. You can sign up for an American Express Business Platinum Card® by filling out an online application that only takes a few minutes. You could get a decision in as quick as 30 seconds and be using your card within two to three days. Our recommended small business credit card is the Chase Ink Business Casd℠ card. The card has no annual fee and you can earn $500 introductory cash back if you spend $3,000 in the first three months. It’s a great card to use for normal business expenses every month to earn cash back for spending you’re doing anyway. Apply online and you could be approved in a few minutes. I have as of today,tripled what I made in the 8months of last year. my credit scores are 620 577 560can any one point me to a place that helps people re establish their credit and grant a 3000.00 loan? Since the car will used for business purposes, you may be able to get an equipment loan or lease for the car. I recommend trying a service like LeaseQ to see if you can qualify for an equipment loan or lease.